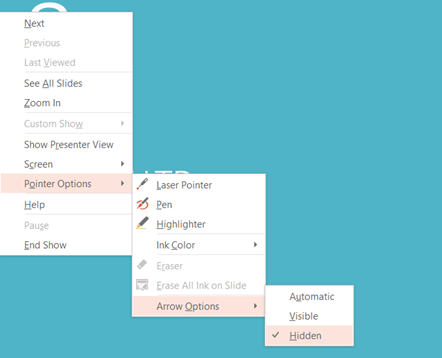 How to Hide Pointer from a slide show in Microsoft PowerPoint 2013? Do you want to hide the mouse pointer when presenting the slides? Here’s a simple trick that lets you to hide the mouse pointer from a slide show in Microsoft PowerPoint 2013. To hide the pointer in a slideshow, press Ctrl + H shortcut key. Another way to hide the pointer is to right click on the slide show which will display a context menu. Select Pointer Options -> Arrow Options -> Hidden as shown in the below screenshot. To display the cursor back, select the “visible” option.